Killing Nazi zombies was a rollicking good time before, but things just got a major upgrade. Call of Duty: World at War: Zombies for iPad combines the new features of the iPad with some prescient updates for a noticeably improved zombie-slaughtering experience. Still, for $15 this visually-pleasing Activision titile may be too pricey for fans who have already downloaded the iPhone version. Of course, the iPad’s exponentially larger screen does wonders for the game’s graphics. Suddenly, there are new little details, like the roughness of your character’s hands and the bloody stains on those of the zombies. The field of vision feels much bigger, due not only to the bigger screen but to the significantly smaller portion of the screen taken up by buttons and joysticks. For example, when you lift your gun to take aim, the gun doesn’t block your vision quite so much. The downside is that while the game's controls and details have been improved to a certain degree, there is a slight pixilation in the blown-up graphics. 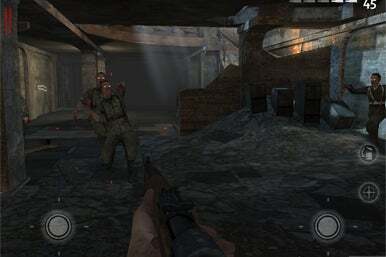 Call of Duty: Zombies for iPad still looks rudimentary compared to the console version of the game, but the iPad version does look much improved over the iPhone version. The maps – Nacht der Untoten and Zombie Verrükt – feature the same bombed out, post apocalyptic, World War II themes; but this time around, the $15 price tag includes both maps, so the complete game costs the same as its iPhone predecessor with the in-app purchase of the second map. The price is still on the high side, but on the iPad it feels much more appropriate. Unfortunately, the controls are still stiff. There are some great upgrades, like the new reload button, but it still takes time and patience to master them. Where it was difficult for people with larger hands to grasp the tiny iPhone and move the joysticks before, it can be a little uncomfortable for the small-handed to stretch their thumbs to control the iPad version. Moving and aiming with the two joysticks still takes time and practice, and never feels intuitive. Thankfully, if you’re not into the dual stick controls, there are two more schemes: “touch screen” allows you to swipe the screen anywhere to look around, while “tilt” uses the iPad’s accelerometer to control the view. But the former makes little difference compared to the stick, and the latter just made me dizzy. The bottom line is the iPad does feel like a more natural fit for the Call of Duty: World at War: Zombies experience, if only because its larger screen is much closer to the televisions and computer monitors that first-person shooter enthusiasts are used to. That said, those who already have the game on the iPhone may not be willing to shell out an addition $15 for a slightly more realized version of the game.